December 13 will be an important date for the fortunes of Democrats across the State of Maryland. It’s not because that is the date of a primary election; that won’t happen for another year and a half. It’s not because a critical piece of legislation will be passing; the General Assembly won’t be in session. And it won’t be because Donald Trump will decide that being President isn’t worth it (although one can dream). December 13 is the day on which the Montgomery County Democratic Central Committee (MCDCC) will select its new officers. And it comes at a critical time for county Democrats, as well as party members all over the state. When MCDCC is acknowledged by the general public at all, it is usually because of its power under the state’s constitution to fill state legislative vacancies. But the Central Committee does far more than that. Its principal purposes are to build the party, support Democratic candidates and turn out its members to vote. Every four years, the county party raises more than $200,000 for state and local elections and more than $700,000 for federal elections. Major uses of funds include voter registration, production of the party’s sample ballot, coordinated campaigning with Democratic candidates in general elections and overhead associated with the party’s office in Kensington. 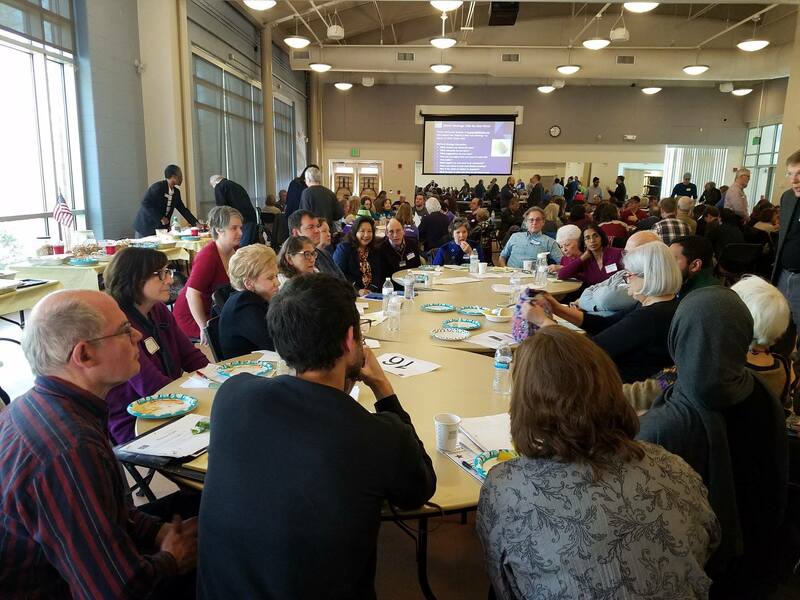 MoCo’s Democratic Party has played a fabled role in state politics for many years. It is by far the wealthiest local party organization in the state. It draws on hundreds of precinct officials and other activists for volunteer activities. It has delivered hundreds of thousands of votes to statewide candidates like former Governors William Donald Schaefer, Parris Glendening and Martin O’Malley, none of whom represented MoCo in their prior positions. The party’s influence has been so extensive that statewide Democratic nominees could offset their losses in Western Maryland and the Eastern Shore by racking up votes in MoCo, thereby leaving the Baltimore suburbs as the battle ground in which most races are decided. But those halcyon days are coming to an end. The MoCo Democratic Party is in trouble, and that means the state Democratic Party is also in trouble. Consider the following. In recent years, federal Democratic candidates almost always win across Maryland in presidential elections outside of the GOP-packed First Congressional District. The real purpose of the party apparatus is to win the races for Governor. From 1990 through 2006, MoCo played an outsize role in Democratic gubernatorial victories. Turnout rates among MoCo Democrats varied from 62% to 69% and, aside from Robert Ehrlich’s win in 2002, contributed heavily to Democratic victories. 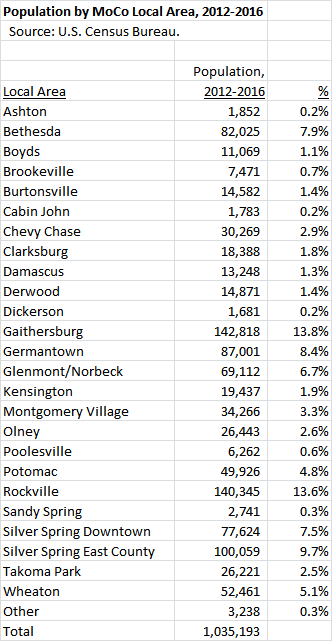 But turnout among MoCo Democrats fell to 55% in 2010 and 45% in 2014. Part of that was due to soaring voter registrations during the Obama years. 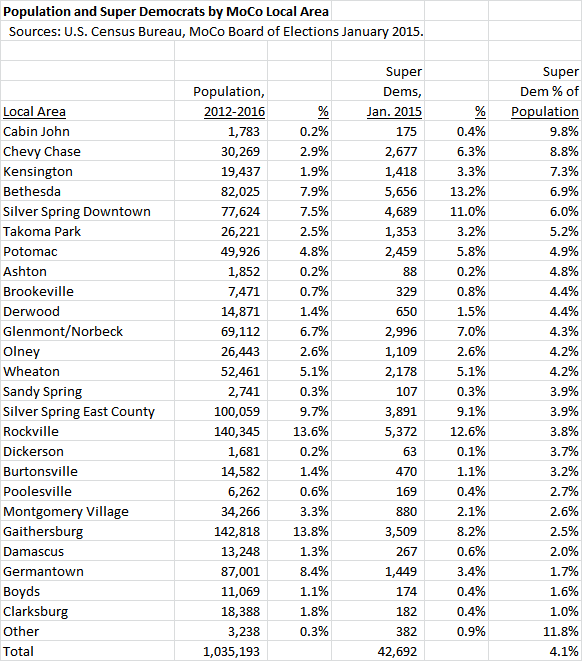 But the absolute number of MoCo Democrats who voted declined by nearly 20,000 between 2006 and 2014. Simply put, the county party has lost its ability to turn out its members for gubernatorial general elections. From 1990 through 2006, roughly 10% of all votes in gubernatorial general elections came from MoCo Democrats. This was a major factor in wins by Schaefer, Glendening and O’Malley. 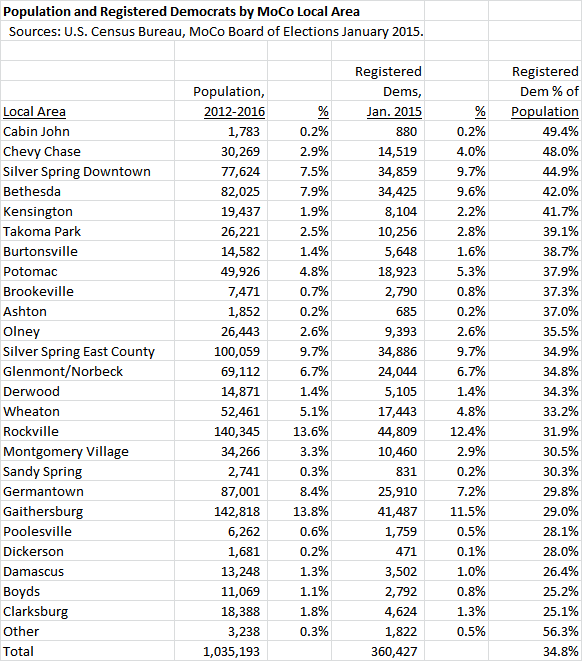 But MoCo Democrats accounted for 9.6% of total votes in 2010 and 9.3% in 2014, the lowest percentages in decades. Let’s put it another way. Between 2006 and 2014, the total number of votes in gubernatorial elections decreased by 60,928. The number of votes cast by MoCo Democrats declined by 19,653. That means MoCo Democrats accounted for nearly one-third of all voter losses statewide over two cycles. Finally, consider this. Larry Hogan won the Governor’s race in 2014 by 65,510 votes. 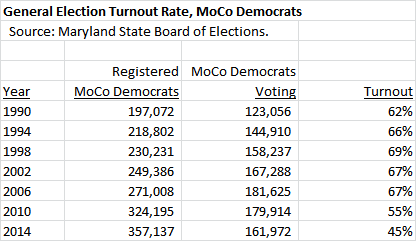 If the turnout rate among MoCo Democrats in 2014 was the same as it was in 2006, they would have cast an additional 77,375 votes. The decline of the MoCo Democratic Party played a huge role in putting Larry Hogan into Government House. Why is this happening? Let’s recall that 2006 was a recent peak of party performance and two massive changes in campaigning have happened since: the rise of political email and the rise of political social media. Those two things contributed mightily to the success of Barack Obama. State and local candidates across Maryland use them aggressively. But not MCDCC. The party’s Facebook page is devoid of interesting content and has just over 1,000 likes in a county that has nearly 400,000 registered Democrats. Its email program is practically non-existent. The party does almost nothing to promote the successes of Democratic elected officials and makes no case against the state’s GOP Governor, who has a 66% job approval rating in MoCo. Even the party’s clunky sample ballot, a vestige of a time when paper was the primary means of political communication, was only mailed out this year to newly registered Democrats when it was once mailed out to all. MCDCC desperately needs new, aggressive and modern leadership. It needs leaders who understand how to campaign in the 21st Century. It needs leaders who are committed to reaching out to people of color and immigrants who disproportionately do not vote in gubernatorial general elections. It needs a new culture of innovation, a culture which values trying new things over and over until some of them actually work. MoCo Democrats, it’s time for change. Van Hollen 82%, Szeliga 16%.Raskin 82%, Cox 14%. Much debate swirls around police brutality in Baltimore and the peaceful protests then riots following Freddie Gray’s death but little discussion has taken place about the political impact of these events. Today’s post focuses on that question. Put bluntly, it puts the squeeze on Democrats. In the struggle over public opinion regarding police actions, many voters tend to give the police the benefit of the doubt as they value law and order and respect that it’s a tough and often dangerous job. That bias can be overcome, as in New York, if protests stay peaceful and the police overplay their hand. In Maryland, however, the Baltimore riots are likely to hurt the Democrats among the swingy white voters who elected Gov. Larry Hogan and helped the Republicans to take the Senate nationally. Remember that the events in Ferguson were in the spotlight just before the 2014 elections. And the effect may not be limited to whites. There is no guarantee that Maryland’s Latino and Asian voters will not be more concerned about public safety than police brutality. People of color are not a political or social monolith. Unsurprisingly, people have strong views on the police, race, and many related issues. However, some of these viewpoints have the potential to harm Democrats greatly. Critically, I emphasize that the point here is not whether the views are right or wrong but that seem likely to me to have a sharp negative political impact. Arguments that these problems all stem from racism will only exacerbate Democratic political problems. Nobody likes being accused of being a racist–an excellent way to alienate voters appalled by the riots. Moreover, they know some of the police involved in Freddie Gray’s death are African American, as is the police chief and mayor. Similarly, efforts to label the riots an “uprising” will strike the same voters as hopelessly out of touch (read: insane). Quotes from Democrats that appear to justify violence, like Del. Maricé Morales’ Facebook post, will be used against Democrats. The sharp spike in the murder rate in the wake of the riots will only increase the demand for law and order. Many of the victims are African American. Charnice Milton, a promising young journalist with a moving personal story, was shot to death just a few days ago in Washington, DC when she got caught in gang crossfire responsible for many recent killings in Baltimore. Blaming chronic neglect of the poorest parts of Baltimore won’t work either. After sixteen years of William Donald Schaefer and Martin O’Malley as Governor, it’s a hard sell that the State has not sent sufficient cash Baltimore’s way. It doesn’t matter whether these points are correct so much as this is how many swing voters will perceive it. It’s their views that shape their votes–not how you think they should see events. Getting a grip on this tough issue politically is going to require a clear message that doesn’t sound hedging yet addresses the very legitimate concerns of the party’s oft-divided constituencies. Borrowing a version of Tony Blair’s “tough on crime, tough on the causes of crime” slogan from the 1990s might fit the bill. Criminal behavior is unacceptable. Full stop. The recent riots stole jobs from working people and burned down housing being built by local leaders for the elderly. Violence eats at the fabric of already struggling communities. For exactly these reasons, we need stronger policing policies that protect the rights and dignity of citizens as well as the police. We need to do it not only because it’s right but because our communities will be safer for it. Mutual lack of trust and hostility between the police and the community is a direct threat to public safety. Crises provide opportunities for leaders. These are tough problems but addressing them can advance the party’s strong commitment to justice and to public safety. Articulating a strong message supporting both is critical to preserving public trust. It’s more complicated that straightforward condemnations of either criminal behavior or police brutality. Fortunately, there are signs of some Democrats leading the way. See the Facebook comments by Del. Brooke Lierman (and the other legislators from D46) as well as Del. David Moon’s call to end the damaging drug war. The Gansler-Ivey poll results are catnip for people like me who follow campaigns but also a good example of why outlets that try to estimate the current shape of election campaigns (e.g. 538, pollster.com) do not include them in their analyses. The press release includes some interesting numbers. I was less interested in the top lines than in the report of Doug Gansler’s favorability ratings. 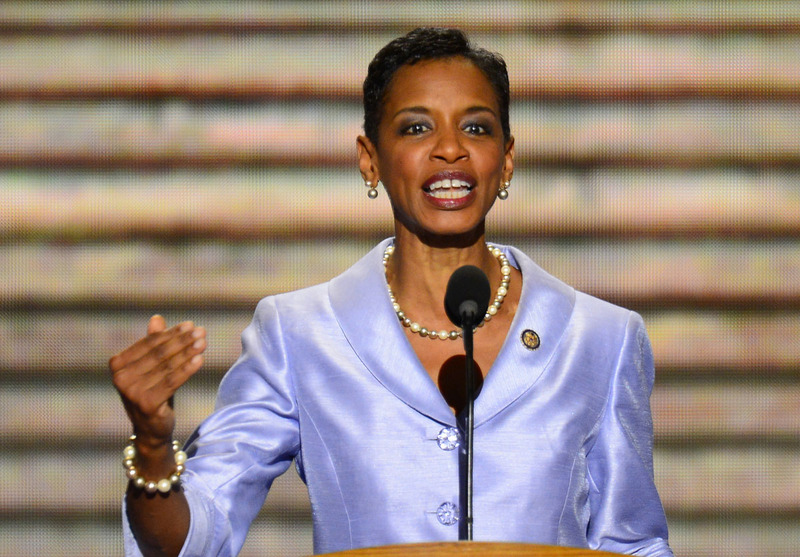 If opinions of the AG have indeed improved since the spate of very bad press earlier this year, that would certainly be good news for the Gansler-Ivey campaign. However, the press release was more telling for what it did not include than what it did. There is no information about the questions that were asked. One poster on Seventh State’s Facebook page claims that the questions were primed to elicit negative responses about Lt. Gov. Anthony Brown. While the poll reported Gansler’s favorability ratings, it did not do the same for either Brown or Mizeur. Additionally, there are no demographic breakdowns. I’d be especially interested to know the gender, racial, and religious composition of the survey, as well as the results for these demographic groups. This information would make it possible to answer several questions. For example, does the share of women estimated in the electorate correspond to past gubernatorial elections? Women routinely makeup a disproportionate share of Democratic primary voters in Maryland but do they in the polling sample? How strong does the poll state support is for candidates among groups whose support they might hope to consolidate? So, while fun to read, I’ll be looking forward to the next poll reported by an outlet not associated with one of the campaigns. Note: I’m supporting Gansler but I try to call it like I see it as is evident here.